I hope you’ve had a great weekend. Yesterday I did some tidying up of my craft bits that had escaped from my studio and taken up residence on the landing! Then I decided to get my new dies – which arrived nearly three weeks ago! – cleaned and filed in my die storage folders. Although this is time-consuming, I enjoy doing it because it includes die cutting with all of the dies. It really helps me in the future when I’m working on projects because I know what the die cut will look like. When I saw all the dies included in the Well Written Framelits Dies, I couldn’t wait to play with them! Hence today’s card! There is a stamp set that co-ordinates with the dies so you can choose what to stamp and what to die cut. For example, if you buy the bundle (page 27 Spring/Summer Catalogue), there are four options for HAPPY BIRTHDAY. You can stamp or die cut both words, or you can stamp HAPPY and die cut BIRTHDAY, or vice versa.The choice really is yours. I went for the die cutting route, and the only stamping I did was the butterfly’s antennae! 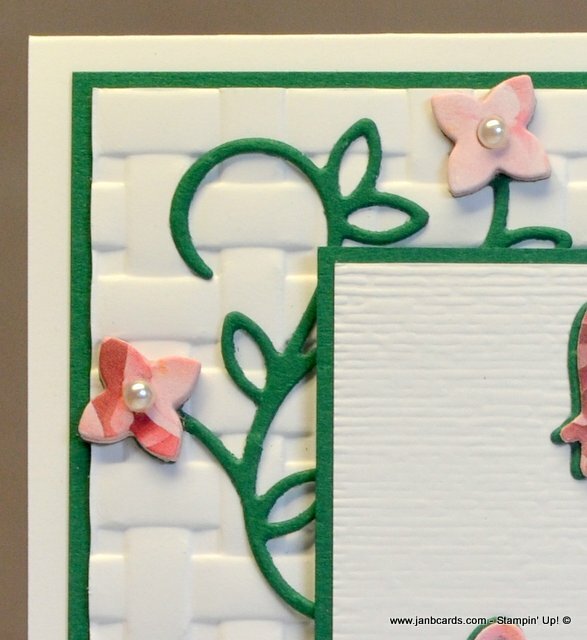 I stamped onto a piece of Whisper White Cardstock (CS) that had been embossed with the Subtle Dynamic Embossing Folder. The design of my card went through a few changes as I worked on it. My plan was to use Shaded Spruce CS and Powder Pink CS, but I decided the overall effect was rather bland. To remedy this I used Petal Promenade Designer Series Paper (DSP) for the flowers. 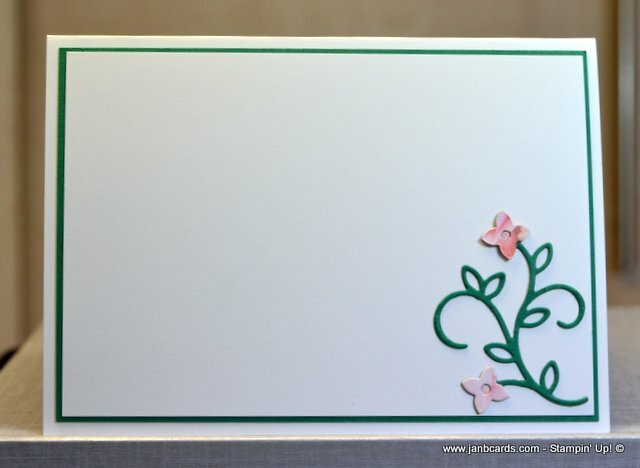 Before adding the DSP flowers, I adhered four layers of cardstock flowers together for each flower. I did the same for the butterfly, but just two layers. I had already die cut the sentiment in Shaded Spuce CS and Powder Pink CS. After adhering them together, slightly offset, I knew it needed DSP on top! This made the sentiment look so much brighter! Then it was a question of putting everything together. I toyed with the idea of using the DSP behind the sentiment layer, but it would have meant not using the flowers. 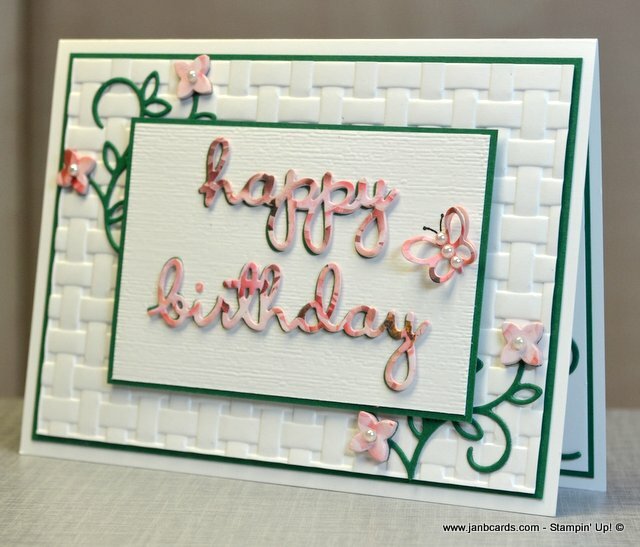 Instead, I decided to use the Basket Weave Dynamic Embossing Folder, which I think has worked really well. 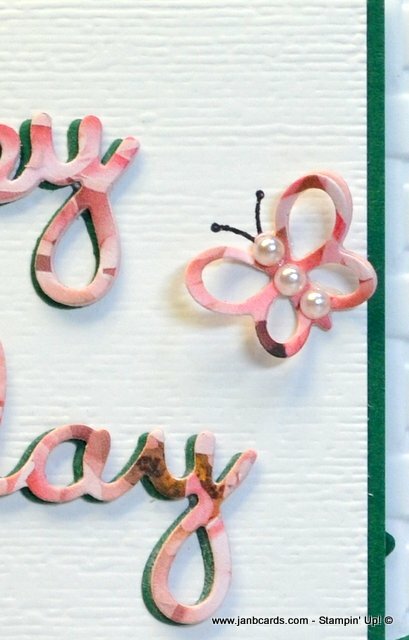 All I needed to do to finish off the front of the card was to add a small Basic Pearl on each of the flowers, and three along the butterfly’s body. 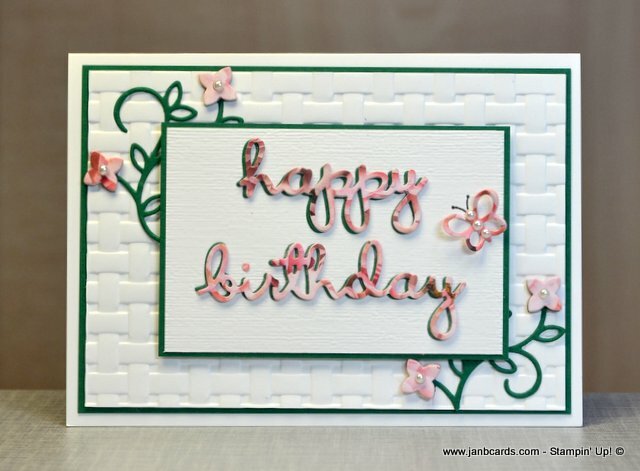 To decorate the inside of the card, I added a layer of Shaded Spruce CS, and a top layer of Whisper White CS. 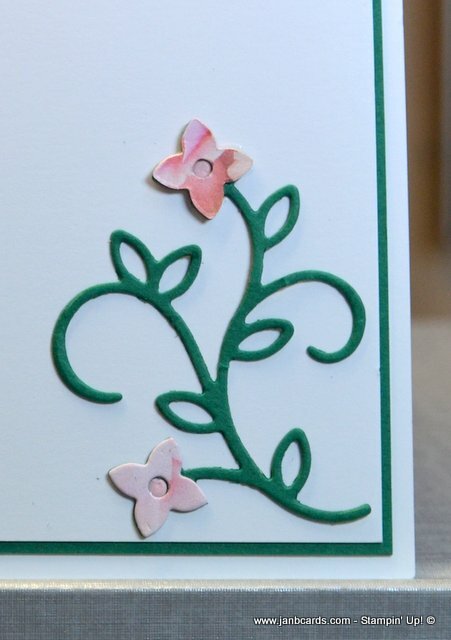 I adhered a Shaded Spruce CS swirly branch die cut, and flowers in the bottom right-hand corner. After adding two DSP flowers, I added two very small circles inside instead of the Basic Pearls I’d added on the outside. I feel this design is outside my “normal” style, but hubby disagrees with me! What do you think? That’s about it from me today. I look forward to being back with you tomorrow. In the meantime, happy crafting. This is a beautiful card. So spring-like. It brightened up my day. I know my eyes are’nt as good as they used to be, but I can’t see a butterfly……. I love the simplicity of this card. I am fascinated with your card designs. There is a simple elegance to them that I have not seen with other stampin up demonstrators. Keep your videos and designs coming!